Catherine Lacey was born in Tupelo, Mississippi and has taught Creative Writing at Columbia University in New York. 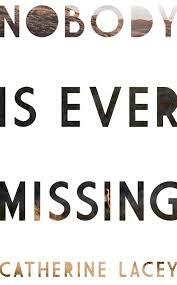 I have reviewed Nobody is Ever Missing here because it is set in New Zealand, and also because it is extraordinary. Elyria walks out on her seemingly comfortable New York existence and gets on a plane to New Zealand. She has an address a lauded writer gave her once – along with an invitation to come and stay with him on his Golden Bay farm. But it isn’t really towards Werner, the author, she is moving – and oddly she acknowledges there is not that much to be running away from – apart from an odd form of nightmare violence from her husband, and a marriage that has deflated after the passing of the blush of shared grief that first brought Elyria and her husband together. Despite her discovering the title of the book – no matter where you go there you are – at the end Elyria has almost reached the ‘bliss’ of non-existence: “No one is anything more than a slow event and I knew I was not a woman but a series of movements, not a life, but a shake …” But at this point she says she has ‘nothing to say anymore, not yet …” And so in a way the book is about what happens after it has finished. For Elyria at some point later tells us her story. A thought-provoking and powerful read.